Cleveland police had charged 12-year-old African American boy Tamir Rice, who was killed by police six months ago, with “aggravated menacing” and “inducing panic,” according to a police document published by US media. In their Twitter account, Cleveland authorities denied on Thursday that any criminal charges were filed against Rice. 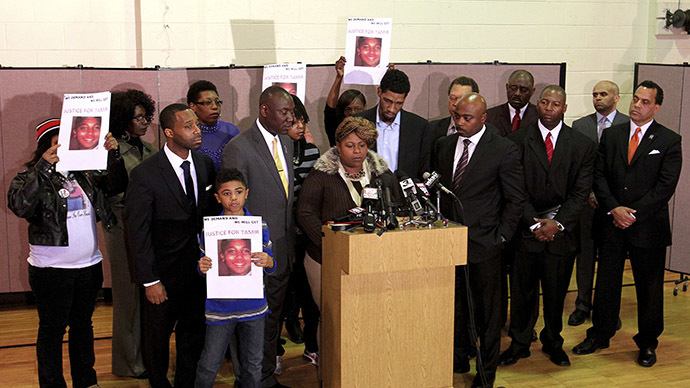 Despite various rumors, Tamir Rice was never charged with a crime. No charges were ever filed. The alleged police report and the authorities’ denial of ever charging Rice of committing a crime have sparked a wide debate with many questioning the reason why Officer Loehmann wasn’t charged. @CityofCleveland Why is Loehman listed as a victim if it is purely a response to the 911 call? @CityofCleveland so if there was no crime, why did you murder him? how can you be so smug? On November 22, 2014, the Cleveland PD received a 911 call concerning a male with a gun at a local playground. Officers Loehmann and Garmback arrived on the scene shortly after. Loehmann fatally shot the boy within two seconds of encountering him at a local park based on presumption that the latter was “pointing a gun at people.” The “weapon” in the boy’s hands appeared to be a non-lethal airsoft pistol. The release of the 911 tape later revealed the caller said he thought the gun was being brandished by a juvenile and was “probably" fake. The boy’s death was ruled a homicide and a criminal investigation into the case was launched. It has been ongoing for nearly six months. As probe continues to stretch on, Cuyahoga County Sheriff Clifford Pinkney has asked for more time to complete a “fair, impartial and thorough investigation.” On May 12, at the first police press conference after the killing, he said that the bulk of investigation has been completed, but that a few more witnesses need to be interviewed and additional forensic evidence needs to be collected. Rice’s family has expressed frustration with the prolonged investigation. "My family is very disappointed with how this investigation has transpired," said Latonya Goldsby, a cousin of Rice’s, following the press conference, US media reported. "There is no transparency in Cleveland." "I feel so disgusted with the city of Cleveland for not showing some type of compassion to my family. We had to bury a 12-year-old kid." According to the Rice’s family attorney Walter Madison, the investigation is not being delayed for any substantive reasons. “[The City of Cleveland] talk nice and are apologetic but they are waging war of a different brand,” he said, as quoted by the Daily Kos. According to the Cleveland Plain-Dealer, a June 1 hearing will determine whether the lawsuit filed by Rice’s family against the city should be put on hold. As of Thursday, neither officer had been charged in connection with the case. However, a month after the shooting The Guardian reported that Loehmann was found unfit for duty prior to joining the police department in Cleveland. It is not clear whether the Cleveland PD checked his record.